Vanessa Diffenbaugh’s debut, The Language of Flowers, made me feel #allthethings. Consequently, I now own the book in paperback and hard cover – and they sit on my shelf right next to the companion guide, A Victorian Flower Dictionary. Even if you judge me, I don’t care. That’s how deep my love for that book went. I blame Anne of Green Gables – I’ve been drawn to orphan stories ever since. I was nervous to pick up We Never Asked for Wings because of all the reasons above. But I shouldn’t have been. Diffenbaugh is an amazing writer who makes me experience lives I’ve never lived. Her descriptions put me right in the middle of Letty, Alex, and Luna’s apartment. I felt as though I could see the birds Alex watches and the mud-caked Luna playing outside. – When Letty returns to take care of her kids on her own after largely being an absent parent, there’s very little resentment or scrutiny from the kids. Luna’s response might be slightly more understandable since she’s much younger, but Alex’s “good kid” persona wore a little thin in this one area. – Letty clearly has a problem with alcohol throughout but never seeks treatment or help and works in a bar. Perhaps that’s only my perception or I may have missed something in my eagerness to finish the story–it’s possible that the author didn’t intend this to be an addiction, but merely a statement of coping in the moment. Still, I found some of those scenes (especially – if you’ve read the book – the one with her and Alex near the beginning) horrifying and sad. – I couldn’t always reconcile the Letty with how she was described. She was an honor student in high school, but someone that driven just gave up on life once an unexpected pregnancy brought her Alex? She made terrible choices with her children but suddenly was the picture of a mother who did things instinctively right? It made for a muddled picture of the main character and I ended up caring about the people in her life more than her. Bottom line: The quality of writing means that the author has kept my trust enough to read book three in the future. 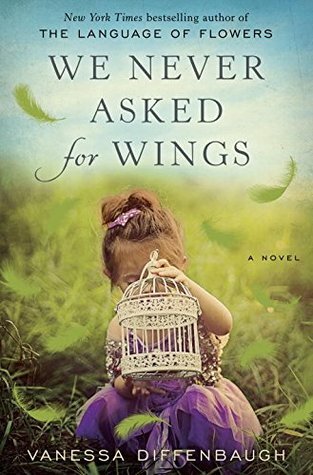 If you’re looking for an engaging, well-paced story with a family dynamic, this would be a good one to read. But if you’re looking to try a book from this author and haven’t read The Language of Flowers, I’d definitely recommend that you pick that book up first. Okay, let’s get something out of the way right now – I am a Brené Brown fan. A friend recommended that I read her book Daring Greatly a few years back and since that point, I can’t get enough. You might know Brené from one of her TED talks. Or maybe you know of her because her book Daring Greatly hit bestseller lists. Or maybe because you have a fan girl like me in your life that won’t shut up about her (#sorrynotsorry). Walking into our stories of hurt can feel dangerous. But the process of regaining our footing in the midst of struggle is where our courage is tested and our values are forged. She is a Ph.D., LMSW, and research professor that studies human behavior and is particularly well-known for her observations about how shame and vulnerability shape our lives and our culture…and how we can use that knowledge and embrace those scary topics to be more brave and live a whole-hearted life. I personally relate to this because as someone who studied counseling in college, human behavior is endlessly fascinating to me. For me, Brené’s style was a refreshing change of pace from the emotionally-driven self-help books out there – Daring Greatly is primarily research-driven. She wasn’t trying to manipulate me into taking her 41 day challenge or anything of the kind. She simply presented her findings and tried to relay the principles of those facts clearly and concisely. What I did with the information was my business. I found myself in her research. Brené manages to put into words feelings that I’ve long harbored but never quite been able to pin down. She not only identifies those things in a quantifiable way, validating my experiences, but goes one step further. By teaching me how those feelings translate into action and how to keep from being sabotaged by them or how to leverage them, frankly, I felt empowered. I believe people at their core really just want freedom. Freedom from the things that hold them back and freedom that allows them to move forward in confidence. Rising Strong represents those truths to me. One thing about Brené is that she doesn’t like to deal in vulnerability. Oh, sure, that’s what she’s known for. But if she had her way, she would have stayed on the clinical research side of things rather than handle the messy aftermath of what her research would mean for her own life. She’s not only the research professional, she’s also one of us. And as such, she’s uniquely gifted to speak to both sides of the issues at hand in a sometimes-bracing-but-always-authentic way. Whole paragraphs (or sometimes just one line) of this book have been highlighted, underlined, and/or are accompanied by one of my notes in the margins. That’s a lot of prelude, I know. But stick with me, okay? Here is what’s different about Rising Strong from Daring Greatly: It’s a lot less research-y. That’s right. The thing I loved so much about her first book is not so much what I found in the second. 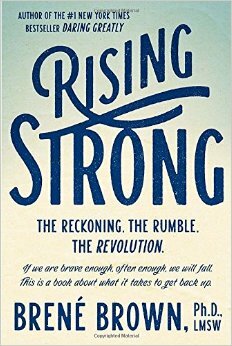 But Rising Strong relies more intensely on Brené’s personal narrative, along with those in her circle of people. And even though I was a tiny bit nervous about this change in format, when I turned the last page I was not disappointed. There are so many things I could say about this book, but I’m going to keep it relatively brief. Rather than unpacking the whole structure of the book, I’m going to go a different way. You know how after you read a book you remember quite a bit, but the longer time passes you by the more you only remember one or two crystalized thoughts? These are mine from Rising Strong. Stay curious. Put simply, the concept is this: we all experience emotion. Some is in relationship to a specific scenario (i.e. I cry because Kris Allen won American Idol), but some emotions come out of nowhere. Brené’s point is that we need to stay curious about those feelings and where they come from and how they ultimately connect with the way we think and behave. This might mean asking questions like “Why am I being so hard on everyone around me today?” or “I can’t stop thinking about that conversation at work. Why not?” (p. 41) As someone that is an expert avoider, this was something that really resonated with me. Chapter 6. This chapter completely wrecked me. I’m serious. I won’t go into depth here, but the chapter poses this question: Do you generally believe that people are basically doing the best they can? Gosh. I wrestled with this question in my heart – about myself and about others. I play judge and jury often in determining whether other people’s actions are appropriate and I often assign motives to them, too. It’s a little like being incensed at the car that cut you off and almost drove you into a ditch but then you learn that the man is driving like that because his wife is in labor and he’s trying to get her to the hospital. Still, not an okay thing to do but so much more understandable from a human perspective. My problem is that my default is always on “jerk face” in those kinds of situations. My self-righteousness gets triggered on a regular basis and it’s become a way of life. So this chapter rocked my world in that way and set a higher standard for me to reach for. Perception is reality: the story you tell yourself about any given situation is real and needs to be based in truth. The overarching principle in this book is that we all play thoughts in a loop in our heads. We tell ourselves a story. She gives an example early on where she and her husband are out swimming in a lake. She tries to have a meaningful conversation with him and gets shut down. Immediately, her thoughts go to “does he not find me attractive anymore? why is he rejecting me?” The story she told herself was that she wasn’t enough and that was the reason for her reaction. Instead, at the end of the swim, when she pressed him he admitted that he was frightened in the middle of the lake and was focused on just getting through the swim and back to shore. It really had nothing to do with her at all, but in her head she made it a “thing”. Women do that all the time. I know because I am one. So, this concept really stuck with me. If you’re interested in reading this book (or any of her others), I should tell you one thing: Brené uses a language/terminology in Rising Strong that she develops in previous books. Because of that, I’d definitely recommend reading at least Daring Greatly before this book. But that’s your call! Bottom line: If you’re interested in being a better version of yourself and always seeking to be more self-aware, this book will push you to new heights. Intensely relatable and endlessly inspiring, I’d be shocked if you didn’t wear your highlighter out while reading this book. Highly recommend! 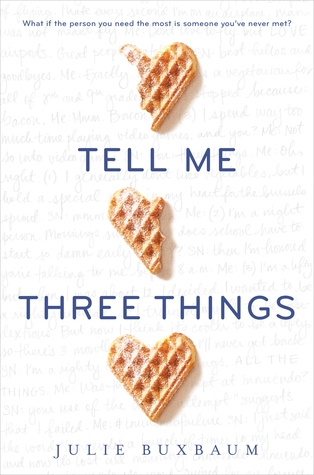 Even before the book released, I saw ads for Tell Me Three Things everywhere and each time I made a mental note* to put it on my Goodreads “To Read” shelf. And because my reading stack has grown to a height that…shall we say…is no longer structurally sound, I needed an excuse to pick it up right away. The only way forward? A sneaky book club move. I suggested it for our next gathering and smugly moved it to the top of my pile. But before we get too far, here’s a quick synopsis (if you’re into that kind of thing). What do you do when your dad decides that dragging you across the country and inserting you into a different high school ecosystem is the best plan of action? You cautiously accept the friendship of the anonymous guy who promises to help you understand the preppy landscape of foreign-ness that is a Los Angeles private school, of course. But who is SN? And will an in-person meeting make their friendship stronger or destroy it altogether? (1.) It reminded me of Ann Brashares’ The Sisterhood of the Traveling Pants series. Just like the Sisterhood books, this book was deeply grounded. Far from a frivolous teen book, the issues Jessie deals with: the death of her mother, tentatively forging the bonds of new friendships, adapting to a different school, trying to assimilate into a family that doesn’t feel quite right, and processing through the tangle of emotions that all these things realistically require of her…well, let’s just say that I shed a few tears. Okay, maybe one-fourth of a tissue box’s worth of tears. (2.) It delivers on the premise. Much like Meg Cabot before her, the author is amazingly skilled at using the email/IM plot device to move the story forward. There was just enough light-hearted banter and high school shenanigans to keep the balance of a good YA novel. The highest praise I can offer is that I never felt like the book was heavy-handed or trying too hard. In fact, I found myself smiling like an idiot in public places while reading. Now I need to do some serious damage control to re-establish my street cred. (3.) It’s well-written. That might sound like a simple compliment, but I think this book was brilliantly paced, expertly woven together, and insightful as heck. I never use a highlighter in fiction books, but I found myself marking a few lines along the way. Bottom line: I don’t need to tell you three things – if you’re looking for a book to break a reading slump and love a good YA coming of age story (with a really cute cover), I have one single piece of advice: get your hands on this book and read it. Posthaste. *The sad reality is that my mental notes are a lot like those cute sticky notes that you can buy in the dollar section at Target – they have more style than substance. Like the rest of the world, I was introduced to Mindy Kaling through her character Kelly Kapoor on The Office. I have to admit, my focus was mostly on Jim and Pam’s interactions and Jim’s pranks on Dwight…so much so that I missed a lot of her brilliance. Until, of course, The Mindy Project happened, quickly followed in succession by the publishing of her first book: Is Everyone Hanging Out Without Me? (And Other Concerns). I appreciated Mindy because she’s not as aloof as some other actresses. Mindy sees the world, operates successfully within it, and has her own voice that cuts through it all – the voice of someone who could be your BFF if you lived in the same area and were, you know, famous. While her first book is quite chronological and focuses on the arch of her life and background, Why Not Me? jumps around. The essays run the gamut from topical rants and recounting of escapades to sage wisdom in an approachable way that only Mindy could manage, but make no mistake, humor is still queen. Mindy tells it to us straight: all women in the television business wear hair extensions, friendships in Hollywood can be terribly shallow, and yes…despite what actors say, the kissing scenes are fun to do. She’s our backstage pass into a world that most of us don’t live in and she doesn’t take that duty lightly. Mindy is fun, of that there is no doubt! But she’s also incredibly insightful and perceptive. Alongside the pop cultural references lie some amazing gems of thought that really stuck with me. She talks about how fame has changed her because she realizes that she’s blessed and wants to act like a better person in the public eye. She talks about walking as a woman in a man’s world, how confidence is absolutely necessary, and that being entitled after you’ve worked hard is not a bad thing (you can read that chapter excerpt here). And then she throws in a humorous anecdote about Bradley Cooper, just to keep you on your toes. Why Not Me? was definitely one of my favorite books of the year, if for no other reason than I got a little insight in to the weird relationship that she and B.J. Novak have. Bottom Line: Perfect for the beach, long airport rides, or your couch this book is a frothy read that will delight you. Just beware that spontaneous laughter is a side effect of turning each page. Yes, Chef by Marcus Samuelsson is in my top two reads for 2013 and I’m slightly surprised because generally I keep to novels. This book obviously isn’t a novel, but I suppose it IS a close cousin: a memoir. Upon learning these snippets, immediately I was intrigued. 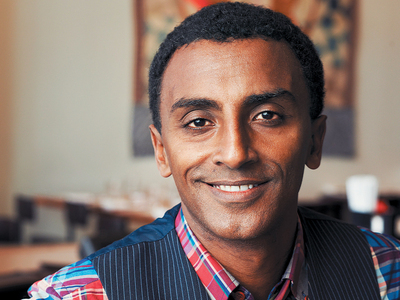 How did someone go from Ethiopia to Sweden to America and end up a celebrity chef? I wanted to experience the story with no pre-conceived notions, so I didn’t even read the description on the back cover (but if you’d like to, it’s below). Yes, Chef chronicles Samuelsson’s journey, from his grandmother’s kitchen to his arrival in New York City, where his outsize talent and ambition finally come together at Aquavit, earning him a New York Times three-star rating at the age of twenty-four. But Samuelsson’s career of chasing flavors had only just begun—in the intervening years, there have been White House state dinners, career crises, reality show triumphs, and, most important, the opening of Red Rooster in Harlem. At Red Rooster, Samuelsson has fulfilled his dream of creating a truly diverse, multiracial dining room—a place where presidents rub elbows with jazz musicians, aspiring artists, and bus drivers. It is a place where an orphan from Ethiopia, raised in Sweden, living in America, can feel at home. I was expecting to be drawn in by Marcus Samuelsson’s story, but the quality of the writing took me off guard in a wonderful way. There’s a clarity to Marcus’ voice that tells me almost as much about his personality as the words he used on the page. As you might expect, the author has a deep passion for his craft. But what you might not know, is that if you look past his eclectic and vibrant fashion statements and his undeniable skill at combining flavors, you’ll find a determined, committed, level-headed person that took necessary, humbling steps toward where he is today. As an added bonus, Marcus’ journey gives a fascinating peek into the backend of the restaurant world. Turns out, there’s more to the food industry than a cursory viewing of Iron Chef lead me to believe. The discipline seems to rival the military–there is a strict order to be followed in earning one’s stripes as a chef. One must impress many harsh critics, both within the kitchen and in the dining room and accomplish tasks with precision even at the mundane level in order to move up the ranks. Marcus’ path through life was one paved by hard work, yes, but also by attitude. Seeing the inner workings of this thought process every step of the way was enlightening. He has a way of diagnosing each and every experience in the moment and responding appropriately according to what would propel him forward most efficiently. The book keeps to the main path of his professional life but I kept wishing that it would delve more into the relationships, too. I suppose you can only ask so much of one book. Bottom line: If you are an aspiring foodie, addicted to cooking shows, or just appreciate an inspiring life story, this book is one you’ll want to add to your reading stack. The only downside to Yes, Chef is that it’s too short. First, just in case you’re wondering, this is not a book that sheds any light on care and keeping of hedgehogs. If you’ve been long harboring a desire to keep a hedgehog as a pet and pick this book up for insight, you’ll be very surprised in the first few pages. Fair warning. Renee is the concierge of a grand Parisian apartment building, home to members of the great and the good. Over the years she has maintained her carefully constructed persona as someone reliable but totally uncultivated, in keeping, she feels, with society’s expectations of what a concierge should be. But beneath this facade lies the real Renee: passionate about culture and the arts, and more knowledgeable in many ways than her employers with their outwardly successful but emotionally void lives. Down in her lodge, apart from weekly visits by her one friend Manuela, Renee lives resigned to her lonely lot with only her cat for company. Meanwhile, several floors up, twelve-year-old Paloma Josse is determined to avoid the pampered and vacuous future laid out for her, and decides to end her life on her thirteenth birthday. But unknown to them both, the sudden death of one of their privileged neighbors will dramatically alter their lives forever. The book’s New York Times bestseller moniker is deservedly earned. The writing is beautiful and the concept of the book is charming. Originally the book was written in French, but let’s not kid ourselves, I read the English translation. A little honor where honor is due: The Elegance of the Hedgehog has been praised by The Washington Post, Los Angeles Times, The New York Times, Chicago Sun-Times, Publishers Weekly and Elle (Italy), to name a few. I’ll be honest, I found the book fairly dense. The cadence of the writing was hard to enjoy, even though the chapters were all short. To be fair, the accounts of Renee and Paloma’s lives are actually quite interesting, if difficult to relate to. However, in between snippets of the story we as readers are “treated” to long soliloquies about their thoughts on philosophy (who cares about phenomenology?) and the mundane (how much can one say about a rugby player?) for pages and pages. At times I thought, “This writing is really beautiful.” But most of the time, I found myself so tangled up in verbiage that I could not have recounted what was happening for any amount of money. The back cover copy makes it sound as though the book is a tale of an older concierge and the younger charge’s friendship. In reality, very little of that happens until the last several pages. The last 60 pages or so did keep me riveted but I wouldn’t have made it that far without the desire to keep myself from bringing shame to my family’s name by flunking out of book club. Bottom Line: If you’re a person who likes a literary read and your bookshelves already have your fair share of translated, acclaimed works of fiction you’ll appreciate the refined turns of phrase. However, if you feel as though life is too short to read discourses on phenomenology and poetic musings on rugby players, better to pass on this book altogether. Let’s be honest, there’s a lot to love about Erin Morgenstern’s The Night Circus. The author does an extraordinary job of creating a vivid, one-of-a-kind setting with a touch of gothic flair. The mental imagery the words created are striking and at times I could almost smell the described scents of the night circus or taste the treats the food carts were selling. This, in my opinion, is a huge feat considering that this whole world has its roots solely in the imagination of the author. On that point, I must concede the brilliance of this book. Looking a little deeper into the plot, however, the magic faded a bit for me. The characters seemed almost interchangeable…all lofty, “magical”, and confident. Just outside of my reach, which in turn made me care very little about them. The effort was very clearly put on the imaginative creation of a world with little regard paid to those inhabiting it. Was this book unlike anything I’ve read? Yes. The Night Circus took me to another place while I was inside it’s pages, and that’s the charm that it offers a reader. Bottom line: If you enjoy fantastical settings and get lost in beautiful prose, this book is for you. You’ll love it. If you need character development to make the story one worth reading, you may want to skip it.